ShoBox made its 2013 debut Friday, and while the year's inaugural installment shared some common traits with last year — Al Haymon-advised fighters appeared in both bouts — it bucked others, in that it did live up to the mission of the Showtime program, which is to test young fighters to see if they're ready to move from "prospect" to "contender." In both cases, for Ronny Rios and Daquan Arnett, the answer was, "no." In the main event, Rios beat Rico Ramos in a fight most people at home seemed to score a draw or narrow win for Rios, but that one fool judge scored a shutout for Rios. Arnett beat Brandon Quarles more definitively, but like Rios, he emerged from the victory with more dings on his would-be contendership than imprimatur. Arnett is a frustrating sort who has an abundance of speed and knows a few tricks, but is like a teenager who was gifted a Corvette as his first car and doesn't know how to handle it and takes it for granted. 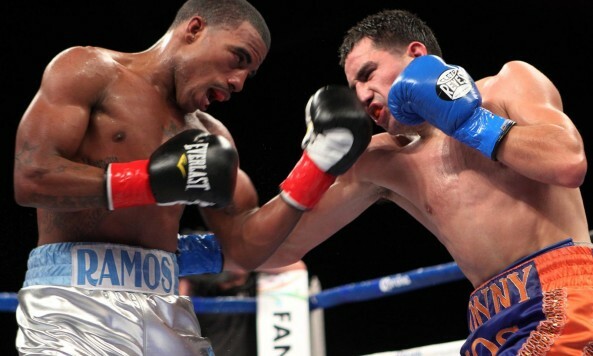 The Haymon-advised junior middleweight started off reasonably well, taking the 1st narrowly with his body work. But he couldn't do anything to keep a determined Quarles from steering it into an inside fight in some of the rounds thereafter, and Arnett was a sucker for right hands, particularly a big one in the 3rd that might've wobbled him; if Quarles was a puncher, he might've had Arnett in big trouble. Arnett kept trying out various gimmicks, like switching to southpaw or adopting a shoulder roll defense, none of it to any particular effect. Eventually, Arnett's ring generalship took over as he found a way to fight from the outside where he should've, and controlled the majority of the rounds in so doing, but it involved Arnett holding a lot when Quarles got inside — yet in the 7th Quarles was the one docked a point for some infraction or the other in a round he was otherwise winning. Good for Quarles for doing his job tonight, and he comes out of this with a "win" based on expectations of his role as an opponent. But Arnett was kind of a mess; he looked amateurish, his focus waxed and waned, his conditioning was lacking and his defense was whack. Opinions are divided on his nickname — I'm a fan of guys who have full sentences for nicknames like Daquan "I Am Orlando" Arnett or Own "What The Heck?" Beck — but everyone probably agrees he has talent, but needs work. A lot of work. Quarles made him look bad. Question answered — he's not ready. Rios showed signs of being ready in stretches, particularly the middle rounds against another frustratingly inconsistent Haymon-advised fighter, Ramos. Ramos moved up to 126 for the opportunity to fight on ShoBox after the kind of HBO performance against Guillermo Rigondeaux that gets guys evicted from TV forever or would be defensible if it did. Rios used his size throughout the bout to do damage, most often with his overhand right to the head and left hook to the body. Ramos, though, was faster, and often more clever. The first two rounds were hell to score, but Rios won the 3rd and 4th easily, with Rios fighting downright scared in the 4th. Yet, despite his skittishness in the 5th, Ramos won the round by letting his hands go against a low-output Rios, a pattern that would return late in the fight as Ramos went into a multi-round lull over the final leg of the bout and Ramos just did more. Rarely did Ramos do any major damage, except maybe with a right in the 8th, while Rios did some hurting in some rounds, particularly with painful body work in the 6th when Ramos went from "oddly skittish" to "oddly brave" by opting to stay on the inside with a superior inside fighter. Fritz Werner turned in a shameful 100-90 card, and it just so happens that Werner has a rep for turning outrageous cards in the past, per my discussion on Twitter with scribes like Doug Fischer, Mark Ortega and Jake Donovan. The other cards were more defensible at 97-93 and 96-94. Let's be clear: Ramos was, is, and probably will continue to be a talent who can look really good in one fight and like a total zero in the next, or both in the same fight, but he definitely won more than zero rounds Friday — a lot more than that. He was a solid test for Rios, whose main problem Friday night was that he faded badly as the fight went on. He looks like he'll often be troubled by speedy types who move a lot, but I'm higher on him than Arnett after this edition of ShoBox, because while they share the problem of conditioning and Arnett has more tools, he's a more level-headed fighter who only has a couple things to work on rather than Arnett having to work on damn near everything.